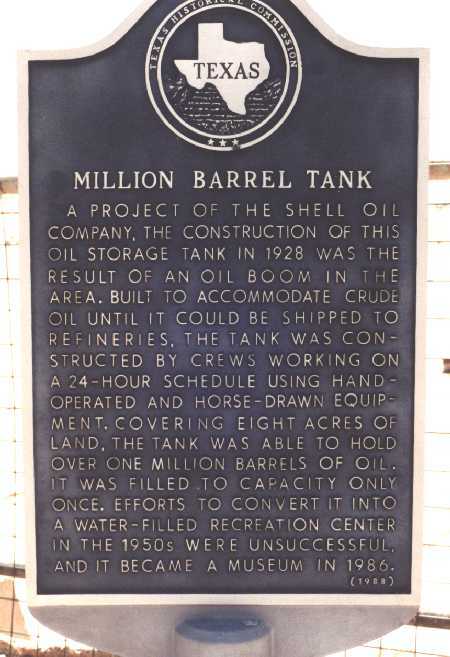 On the southeastern outskirts of Monahans lies a true monument to the Texas Oil Boom era, The "Million Barrel" constructed in the winter of 1928 by the Shell Oil Company to provide badly needed crude oil storage. From east to west, the Million Barrel measures 426 feet 6 inches across the floor, and from north to south, it measures 522 feet 6 inches. Work on the tank was completed in only 90 days of working around the clock. 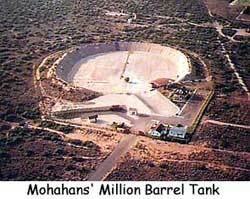 When operational, the tank stored a million barrels of crude which where delivered to Oklahoma for refinement. Filled only once, Shell abandoned it in the early 1930's. Today, it's evident to most everyone in West Texas that the storage tank was never meant to serve just one purpose. Now called the Million Barrel Museum, the tank plays host to community and private barbeques, dances, chili cook-offs, craft shows and class reunions. A segment of the tank wall was used to create the 400 seat Meadows Amphitheaters where performances are held. Other exhibits at the Million Barrel Museum include the old Monahans jail just as it was in 1928, a section of track with a vintage caboose and a boxcar filled with railroad memorabilia. Nearby is a railroad section house and the Pyote Telephone Exchange Building. The Million Barrel Museum is the ideal place to return to the West Texas 20's lifestyle and see housing, farm equipment, a 1928 pulling rig along with a portable school house featuring turn of the century medical and photographic equipment plus much more. Tuesday - Saturday: 10:00 A.M. to 6:00 P.M.